When alkane is exposed to hydrogen bromide, alkyl bromide is formed. It was noticed that when freshly distilled 1-butene is exposed to hydrogen bromide, 2-bromobutane is obtained. This product is formed by Markovnikov addition in accord with the ionic mechanism for electrophilic addition of HBr. Curiously, the same reaction, when carried out with a sample of 1-butene that has been exposed to air, proceeds much more quickly and gives an entirely different result. In this case, we isolate 1-bromobutane, formed by anti-Markovnikov addition. It was discovered that the culprits responsible for anti-Markovnikov additions were radicals formed from peroxides, ROOR, in alkene samples that had been stored in the presence of air. The halogen atom’s attack is regioselective, creating the relatively more stable secondary radical rather than the primary one. This result is reminiscent of the ionic additions of hydrogen bromide except that the roles of the proton and bromine are reversed. Initiation: In the ionic mechanism, a proton attacks first to generate the more stable carbocation, which is then trapped by bromide ion. In the radical mechanism, a bromine atom is the attacking species, creating the more stable radical center. Heating leads to homolytic fragmentation of the bond – that is, the bond breaks such as to leave one unpaired electron on each atom. Strong sources of light can also serve cleavage this bond. The bond which peroxides contain is very weak. The alkyl radical subsequently reacts with HBr by abstracting hydrogen and regenerating the chain-carrying bromine atom. This is the species that add to the alkene. 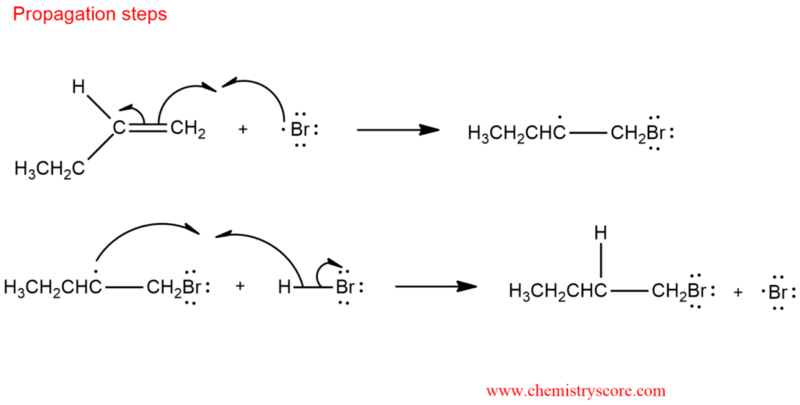 Propagation: Both propagation steps are exothermic, and the reaction proceeds rapidly. 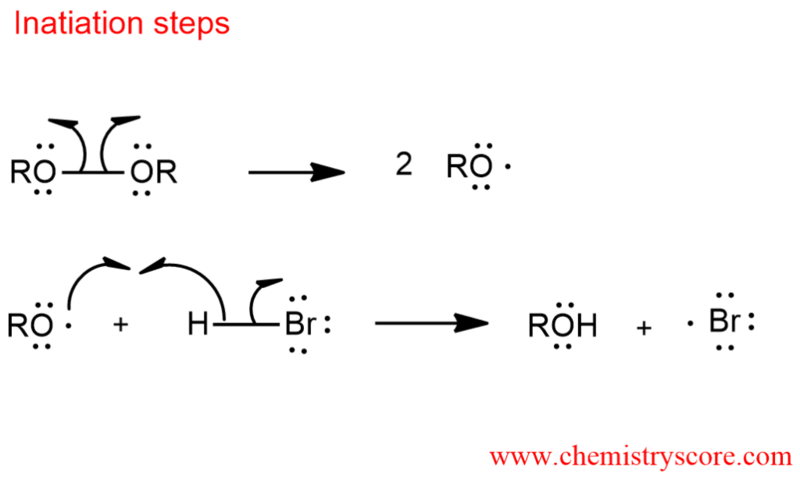 Addition to the alkene will preferably occur in such a way that the most stable free radical is formed. That is way bromine ends up on the least substituted carbon od alkene. In the second propagation step, the secondary radical removes hydrogen from HBr, liberating a bromine radical, and the cycle continues. Termination: As usual, termination is by radical combination or some other removal of the chain carriers.